The origin of this scullcup comes from a tribal remote Bhutanese community of Sakten, located in far Eastern Bhutan. While most Bhutanese cremate their dead bodies as per Buddhist ritual proceedings, these tribal communities feed the dead bodies to the river mammals by cutting them into pieces. It is believed that by feeding their bodies to the water mammals, the dead person’s soul can achieve nirvana and instant rebirth in one the higher realms. 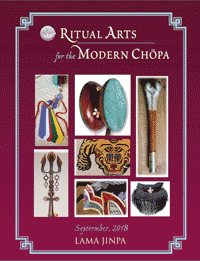 The process of obtaining the kapala (scull cups) and human thigh bone Kangling trumpet proceeds in a complex and time-consuming process. First, the head and the thigh bone of the corpse are extracted and then being immersed carefully in a select marshy land area for over 3 to 6 months. It is then exhumed, ensuring that all fleshy portions are completely separated. 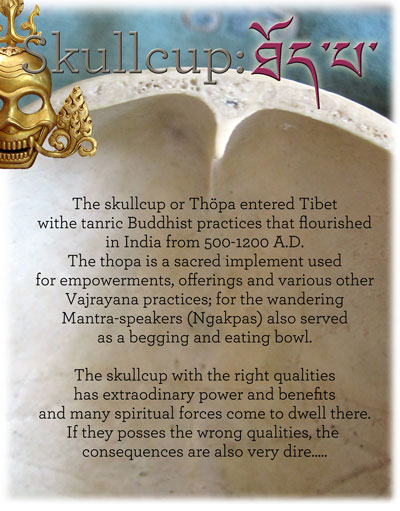 Any of the local lay monks (ngakpas) can perform the art of separating the skull (Thopa or Kapala) from the head portion and sizing down the thigh bones for kangling. It is then cooked and boiled thoroughly for several days until all the fat content has been removed. Then the final involves cleansing, using sacred, blessed water (amrita or dutsi) and then polishing with baked river sand. This painstaking procedure preserves the original color and all the internal architecture of the kapala skull cup. Often the brownish dot marks visible inside the cups are not associated with any kind of artificial coloring. During the process of polishing and cleansing the interior portions of the cup, original saffron herb and several blessed amrita liquids are used to cleanse the cup and to determine that the internal portions of the cup are thoroughly cleansed. The yellowish color inside and outside the scull cup is applied with saffron color to protect humid weather and fungus, which can be cleaned by warm water and any type of mild soap, should one wish to maintain the original color of the cup. Beneath the outer portion of the cup, one, two or three tiny holes are visible to determine the grading of the scull cups. There are three different categories or grades of skull cups. Scull cups with three SUTURES are third grade (Dumbur Sumpa), two SUTURES are second grade (Dumbur Nyipa) and one single SUTURE (all fused)are graded as grade one (Dumbur Chikpa). Bone kangling are USD 750.00. (as opposed to 1980 in Nepal, when they were literally $25 and easily available! ).